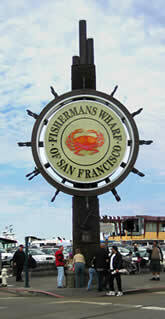 Fisherman's Wharf is easily San Francisco's most popular attraction. While it is fairly touristy, with all the obligatory t-shirt shops, it is still worth a visit. One thing this area has is energy. The bustle of the crowds, the music of the street performers, the colors and aromas all combine to help you feel the spirit of San Francisco. Situated on the shore of San Francisco Bay, its historic waterfront is filled with restaurants, art galleries, entertainment, countless shops and is the embarkation point for Alcatraz island. 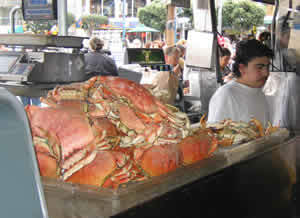 This is a great place to grab a sour dough bowl of clam chowder or a steamed dungeness crab. At the wharf's western end is Ghirardelli Square, renowned for its chocolate. Our tip to you, try the hot fudge sundae. The square features three levels of unique shops. Across the street are the National Maritime Museum, Hyde Street Pier, Hyde Street Cable Car Turn-around, and the Aquatic Park. Amongst the myriad of entertainment, shopping and dining take a stroll through the renovated wax museum now one of the world's largest. The museum is replete with the Chamber of Horrors, Hall of Religion, the historic Library of U.S. Presidents, the spectacular Recreation of King Tut's Tomb and the unique Palace of Living Art, where the world's most famous masters, and their masterpieces come to life through the magic of wax artistry. At the eastern end you will find the Blue and Gold fleet, transportation to Alcatraz, and Pier 39. Pier 39 features even more shopping, over 100 shops and nearly a dozen restaurants. Travel to the end of the pier and ride the double decker carousel. Two different cable car lines serve Fisherman's Wharf. The Powell-Hyde line delivers you near Ghirardelli Square and the Powell-Mason drops you near the other end of the wharf at Bay Street.